NICE แนะนำให้รักษาด้วยยาแก้ซึมเศร้าแบบ SSRI บวกกับการแทรกแทรงทางจิต-สังคมเป็นการรักษาลำดับสองสำหรับโรคซึมเศร้าขั้นอ่อนระยะสั้น และเป็นการรักษาลำดับแรกสำหรับโรคปานกลางหรือหนัก และสำหรับโรคเบาแต่เกิดขึ้นซ้ำ ๆ หรือมีมานานแล้ว ส่วนสมาคมจิตเวชอเมริกัน (APA) รวมการรักษาด้วยยาเป็นทางเลือกการรักษาลำดับแรกสำหรับโรคซึมเศร้า โดยเฉพาะเมื่อ "มีประวัติตอบสนองที่ดีต่อยาแก้ซึมเศร้า มีอาการระดับปานกลางจนถึงรุนแรง มีปัญหาสำคัญในการนอนหรือความอยากอาหาร มีกายใจไม่สงบ เป็นความต้องการของคนไข้ และคาดหวังว่าจะต้องรักษาเพื่อดำรงสภาพ (maintenance)"
นอกจากนั้นแล้ว มีงานศึกษาหนึ่งที่พบความสัมพันธ์ระหว่างการใช้ฟลูอ็อกเซทีนในช่วงไตรมาสแรก กับความเสี่ยงที่สูงขึ้นของพัฒนาการรองที่ผิดปกติ (minor fetal malformation) ของทารกในครรภ์ แต่ว่า งานปริทัศน์เป็นระบบต่องาน 21 งาน สรุปว่า "ความเสี่ยงที่ปรากฏสูงขึ้นสำหรับการเกิดหัวใจผิดปกติของทารกในครรภ์ที่สัมพันธ์กับการใช้ฟลูอ็อกเซทีนของมารดา ก็พบเร็ว ๆ นี้ด้วยในหญิงซึมเศร้าที่ผัดผ่อนการรักษาด้วย SSRI เมื่อตั้งครรภ์ และดังนั้น มีโอกาสมากที่สุดว่าเป็นอคติที่เกิดจากการเลือกตัวอย่าง (ascertainment bias) โดยทั่วไปแล้ว หญิงที่รักษาด้วยฟลูอ็อกเซทีนในช่วงไตรมาสแรกของการตั้งครรภ์ไม่ปรากฏกว่า ทารกในครรภ์มีความเสี่ยงสูงขึ้นต่อพัฒนาการสำคัญที่ผิดปกติ (major fetal malformations)"
↑ 1.0 1.1 1.2 1.3 1.4 1.5 1.6 1.7 1.8 1.9 "PROZAC® Fluoxetine Hydrochloride" (PDF). TGA eBusiness Services. Eli Lilly Australia Pty. Limited. 2013-10-09. สืบค้นเมื่อ 2013-11-23. ↑ 2.0 2.1 2.2 2.3 2.4 2.5 "Fluoxetine Hydrochloride". The American Society of Health-System Pharmacists. สืบค้นเมื่อ 2015-12-02. ↑ 3.0 3.1 3.2 3.3 3.4 "Prozac Label" (PDF). FDA. 2014. สืบค้นเมื่อ 2016-04-05. ↑ "Fluoxetine Pregnancy and Breastfeeding Warnings". สืบค้นเมื่อ 2015-12-02. ↑ Hagerman, Randi Jenssen (1999-09-16). Neurodevelopmental Disorders: Diagnosis and Treatment. Oxford University Press. ISBN 019512314X. Dech and Budow (1991) were among the first to report the anecdotal use of fluoxetine in a case of PWS to control behavior problems, appetite, and trichotillomania. ↑ Truven Health Analytics, Inc. DrugPoint® System (Internet) [cited 2013 Oct 4]. Greenwood Village, CO: Thomsen Healthcare; 2013. ↑ Australian Medicines Handbook 2013. The Australian Medicines Handbook Unit Trust; 2013. ↑ British National Formulary (BNF) 65. Pharmaceutical Pr; 2013. ↑ "Fluoxetine Hydrochloride". The American Society of Health-System Pharmacists. สืบค้นเมื่อ 2011-04-03. ↑ "NIMH•Eating Disorders". The National Institute of Mental Health. National Institute of Health. 2011. สืบค้นเมื่อ 2013-11-25. ↑ Kirsch, Irving; Deacon, BJ; Huedo-Medina, TB; Scoboria, A; Moore, TJ; Johnson, BT (2008). "Initial Severity and Antidepressant Benefits: A Meta-Analysis of Data Submitted to the Food and Drug Administration". PLoS Medicine. PLoS Med. 5 (2): e45. doi:10.1371/journal.pmed.0050045. PMC 2253608. PMID 18303940. ↑ "CG90 Depression in adults: full guidance" (PDF). National Institute for Health and Care Excellence. ↑ Cohen, D (2007). "Should the use of selective serotonin reuptake inhibitors in child and adolescent depression be banned?". Psychotherapy and psychosomatics. 76 (1): 5–14. doi:10.1159/000096360. PMID 17170559. ↑ "Fluoxetine in pregnancy: slight risk of heart defects in unborn child" (PDF). MHRA. Medicines and Healthcare Products Regulatory Agency. 2011-09-10. สืบค้นเมื่อ 2013-11-23. ↑ Koda-Kimble, MA; Alldredge, BK (2012). Applied therapeutics: the clinical use of drugs (10th ed.). Baltimore: Wolters Kluwer Health/Lippincott Williams & Wilkins. ISBN 978-1609137137. ↑ Calil, HM (2001). 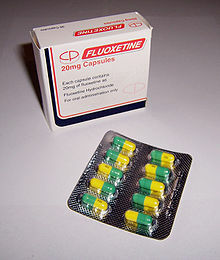 "Fluoxetine: a suitable long-term treatment". J Clin Psychiatry. 62 Suppl 22: 24–9. PMID 11599644. ↑ Rosenbaum, JF; Zajecka, J (1997). "Clinical management of antidepressant discontinuation". The Journal of Clinical Psychiatry. 58 Suppl 7: 37–40. PMID 9219493. ↑ Schatzberg, AF; Blier, P; Delgado, PL; Fava, M; Haddad, PM; Shelton, RC (2006). "Antidepressant discontinuation syndrome: Consensus panel recommendations for clinical management and additional research". The Journal of Clinical Psychiatry. 67 Suppl 4: 27–30. PMID 16683860. ↑ Fava, M (2006). "Prospective studies of adverse events related to antidepressant discontinuation". The Journal of Clinical Psychiatry. 67 Suppl 4: 14–21. PMID 16683858. ↑ "Antidepressant Use in Children, Adolescents, and Adults". FDA. 2007-05-02. ↑ Klein, Donald F (2005). "The Flawed Basis for FDA Post-Marketing Safety Decisions: The Example of Anti-Depressants and Children". Neuropsychopharmacology. 31 (4): 689–99. doi:10.1038/sj.npp.1300996. PMID 16395296. ↑ Hammad, Tarek A (2004-09-13). "Results of the Analysis of Suicidality in Pediatric Trials of Newer Antidepressants" (PDF). Presentation at the Meeting of Psychopharmacologic Drugs Advisory Committee and the Pediatric Advisory Committee on September 13, 2004. FDA. pp. 25, 28. สืบค้นเมื่อ 2008-01-06. ↑ Gunnell, D.; Saperia, J; Ashby, D (2005). "Selective serotonin reuptake inhibitors (SSRIs) and suicide in adults: Meta-analysis of drug company data from placebo controlled, randomised controlled trials submitted to the MHRA's safety review". BMJ. 330 (7488): 385. doi:10.1136/bmj.330.7488.385. PMC 549105. PMID 15718537. ↑ "Toxicity". Fluoxetine. PubChem. NCBI. สืบค้นเมื่อ 2015-03-13. ↑ Ciraulo, DA; Shader, RI, eds. (2011). Pharmacotherapy of Depression. SpringerLink (2nd ed.). New York, NY: Humana Press. doi:10.1007/978-1-60327-435-7. ISBN 978-1-60327-434-0. ↑ 57.0 57.1 Sandson, Neil B.; Armstrong, Scott C.; Cozza, Kelly L. (2005). "An Overview of Psychotropic Drug-Drug Interactions". Psychosomatics. 46 (5): 464–94. doi:10.1176/appi.psy.46.5.464. PMID 16145193. ↑ Roth, BL; Driscol, J (2011-01-12). "PDSP Ki Database". Psychoactive Drug Screening Program (PDSP). University of North Carolina at Chapel Hill and the United States National Institute of Mental Health. สืบค้นเมื่อ 2013-06-24. ↑ Owens, MJ; Knight, DL; Nemeroff, CB (2001-09-01). "Second-generation SSRIs: human monoamine transporter binding profile of escitalopram and R-fluoxetine". Biological Psychiatry. 50 (5): 345–50. doi:10.1016/s0006-3223(01)01145-3. PMID 11543737. ↑ 63.0 63.1 Koch, S; Perry, KW; Nelson, DL; Conway, RG; Threlkeld, PG; Bymaster, FP (2002). "R-fluoxetine Increases Extracellular DA, NE, As Well As 5-HT in Rat Prefrontal Cortex and Hypothalamus an in vivo Microdialysis and Receptor Binding Study". Neuropsychopharmacology. 27 (6): 949–59. doi:10.1016/S0893-133X(02)00377-9. PMID 12464452. ↑ Miguelez, C.; Fernandez-Aedo, I.; Torrecilla, M.; Grandoso, L.; Ugedo, L. (2009). "Α2-Adrenoceptors mediate the acute inhibitory effect of fluoxetine on locus coeruleus noradrenergic neurons". Neuropharmacology. 56 (6–7): 1068–73. doi:10.1016/j.neuropharm.2009.03.004. PMID 19298831. ↑ Brunton, PJ (2015). "Neuroactive steroids and stress axis regulation: Pregnancy and beyond". The Journal of Steroid Biochemistry and Molecular Biology. 160: 160–168. doi:10.1016/j.jsbmb.2015.08.003. PMID 26259885. ↑ "Fluoxetine". IUPHAR Guide to Pharmacology. IUPHAR. สืบค้นเมื่อ 2014-11-10. ↑ "Calcium activated chloride channel". IUPHAR Guide to Pharmacology. IUPHAR. สืบค้นเมื่อ 2014-11-10. ↑ 77.0 77.1 "Prozac Pharmacology, Pharmacokinetics,Studies, Metabolism". RxList.com. 2007. สืบค้นเมื่อ 2007-04-14. ↑ Mandrioli, R.; Forti, G. C.; Raggi, M. A. (2006). "Fluoxetine Metabolism and Pharmacological Interactions: The Role of Cytochrome P450". Current Drug Metabolism. 7 (2): 127–33. doi:10.2174/138920006775541561. PMID 16472103. ↑ Hiemke, Christoph; Härtter, Sebastian (2000). "Pharmacokinetics of selective serotonin reuptake inhibitors". Pharmacology & Therapeutics. 85: 11–28. doi:10.1016/S0163-7258(99)00048-0. ↑ 80.0 80.1 Burke, William J.; Hendricks, Shelton E.; McArthur-Miller, Delores; Jacques, Daniel; Bessette, Diane; McKillup, Tracy; Stull, Todd; Wilson, James (2000). "Weekly Dosing of Fluoxetine for the Continuation Phase of Treatment of Major Depression: Results of a Placebo-Controlled, Randomized Clinical Trial". Journal of Clinical Psychopharmacology. 20 (4): 423–7. doi:10.1097/00004714-200008000-00006. PMID 10917403. ↑ "Drug Treatments in Psychiatry: Antidepressants". Newcastle University School of Neurology, Neurobiology and Psychiatry. 2005. สืบค้นเมื่อ 2007-04-14. ↑ 82.0 82.1 Pérez, Victor; Puiigdemont, Dolors; Gilaberte, Inmaculada; Alvarez, Enric; Artigas, Francesc; Grup de Recerca en Trastorns Afectius (2001). "Augmentation of Fluoxetine's Antidepressant Action by Pindolol: Analysis of Clinical, Pharmacokinetic, and Methodologic Factors". Journal of Clinical Psychopharmacology. 21 (1): 36–45. doi:10.1097/00004714-200102000-00008. PMID 11199945. ↑ Brunswick, David J.; Amsterdam, Jay D.; Fawcett, Jan; Quitkin, Frederic M.; Reimherr, Frederick W.; Rosenbaum, Jerrold F.; Beasley Jr, Charles M. (2002). "Fluoxetine and norfluoxetine plasma concentrations during relapse-prevention treatment". Journal of Affective Disorders. 68 (2–3): 243–9. doi:10.1016/S0165-0327(00)00333-5. PMID 12063152. ↑ 84.0 84.1 Henry, Michael E; Schmidt, Mark E; Hennen, John; Villafuerte, Rosemond A; Butman, Michelle L; Tran, Pierre; Kerner, Lynn T; Cohen, Bruce; Renshaw, Perry F (2005). "A Comparison of Brain and Serum Pharmacokinetics of R-Fluoxetine and Racemic Fluoxetine: A 19-F MRS Study". Neuropsychopharmacology. 30 (8): 1576–83. doi:10.1038/sj.npp.1300749. PMID 15886723. ↑ Lemberger, L; Bergstrom, RF; Wolen, RL; Farid, NA; Enas, GG; Aronoff, GR (1985). "Fluoxetine: Clinical pharmacology and physiologic disposition". The Journal of Clinical Psychiatry. 46 (3 Pt 2): 14–9. PMID 3871765. ↑ Pato, MT; Murphy, DL; Devane, CL (1991). "Sustained plasma concentrations of fluoxetine and/or norfluoxetine four and eight weeks after fluoxetine discontinuation". Journal of Clinical Psychopharmacology. 11 (3): 224–5. doi:10.1097/00004714-199106000-00024. PMID 1741813. ↑ 88.0 88.1 Verispan. "Top 200 Generic Drugs by Units in 2010" (PDF). Drug Topics. ↑ 90.0 90.1 Wong, David T.; Bymaster, Frank P.; Engleman, Eric A. (1995). "Prozac (fluoxetine, lilly 110140), the first selective serotonin uptake inhibitor and an antidepressant drug: Twenty years since its first publication". Life Sciences. 57 (5): 411–41. doi:10.1016/0024-3205(95)00209-O. PMID 7623609. ↑ 91.0 91.1 Wong, David T.; Horng, Jong S.; Bymaster, Frank P.; Hauser, Kenneth L.; Molloy, Bryan B. (1974). "A selective inhibitor of serotonin uptake: Lilly 110140, 3- (p-Trifluoromethylphenoxy) -n-methyl-3-phenylpropylamine". Life Sciences. 15 (3): 471–9. doi:10.1016/0024-3205(74)90345-2. PMID 4549929. ↑ 92.0 92.1 Breggin, Peter R.; Ginger Ross Breggin (1995). Talking Back to Prozac. Macmillan Publishers. pp. 1–2. ISBN 978-0-312-95606-6. ↑ Swiatek, Jeff (2001-08-02). "Prozac's profitable run coming to an end for Lilly". The Indianapolis Star. ↑ "Lilly Goes Off Prozac The drugmaker bounced back from the loss of its blockbuster, but the recovery had costs". Fortune Magazine. 2004-06-28. ↑ 96.0 96.1 Class, Selena (2002-12-02). "Pharma Overview". สืบค้นเมื่อ 2009-06-15. ↑ "Lilly menstrual drug OK'd". CNN. 2000-07-06. ↑ Mechatie, Elizabeth (1999-12-01). "FDA Panel Agrees Fluoxetine Effective For PMDD". International Medical News Group. ↑ "A Biotech Phoenix Could Be Rising". Forbes. 2002-09-25. ↑ "Drug Maker Is Set to Ship Generic Prozac". New York Times. 2001-08-02. ↑ "Patent Expiration Dates for Common Brand-Name Drugs". สืบค้นเมื่อ 2007-07-20. ↑ 102.0 102.1 102.2 "Sarafem Nation". Village Voice. 2000-12-05. ↑ "Galen to Pay $295 Million For U.S. Rights to Lilly Drug". Wall Street Journal. 2002-12-09. ↑ "Galen takes Lilly's reinvented Prozac". Telegraph. 2002-12-10. ↑ "New Medicines Seldom Contain Anything New, Study Finds". New York Times. 2002-05-29. ↑ "Renamed Prozac Fuels Women's Health Debate". Washington Post. 2001-04-29. ↑ "Press Release - FAA Proposes New Policy on Antidepressants for Pilots". Faa.gov. 2010-04-02. สืบค้นเมื่อ 2012-02-10. ↑ Ravilious, K (2010-07-16). "Prozac Pollution Making Shrimp Reckless". National Geographic. สืบค้นเมื่อ 2013-11-25. ↑ "Pharmacological treatment of mental disorders in primary health care" (PDF). WHO. 2009. ↑ "Causation, bias and confounding: a hitchhiker's guide to the epidemiological galaxy". BMJ. ↑ Healy, David; Herxheimer, Andrew; Menkes, David B. (2006). "Antidepressants and Violence: Problems at the Interface of Medicine and Law". PLoS Medicine. 3 (9): e372. doi:10.1371/journal.pmed.0030372. PMC 1564177. PMID 16968128. ↑ Breggin, Peter R.; Ginger Ross Breggin (1995). Talking Back to Prozac. Macmillan Publishers. p. 154. ISBN 978-0-312-95606-6.